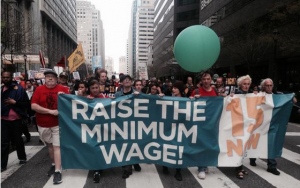 STATEMENT ON OREGON’S NEW MINIMUM WAGE: WILL THE BALLOT MEASURE CONTINUE? On February 18th, Oregon’s state legislature gave final passage to a minimum wage bill that will move Oregon to the highest minimum wage in the nation. Although not a statewide $15, the partial and extended increase that will move 25 Portland area cities to $15 by 2023 is clearly the result of massive pressure brought on legislators and the business sector by 15 Now Oregon and the growing national movement for $15.Unfortunately,as all the living wage studies show$15 isn’t even enough in Portland right now let alone by 2023, andthe bill’s attempt to account for minor differences in cost of living throughout the state by phasing in three different regional minimum wages accomplishes little other than leaving hundreds of thousands of working people behind. The bill increases the minimum wage in three tiers. In the 18 counties the bill defines as rural, the minimum wage increases to $12.50 by 2022. For the rest of the counties outside of the Portland Metro area the minimum wage increases to $13.50 by 2022. And for the 25 cities in the Portland Metro area, the minimum wage will increase $14.75 by 2022, and after the cost of living adjustment in 2023 the wage for those 25 cities will reach $15 per hour or higher. Unfortunately $15 isn’t even enough in the Portland area right now, let alone by 2023. Furthermore, the bill’s attempt to account for minor differences in cost of living throughout the state by phasing in three different regional minimum wages accomplishes little other than leaving hundreds of thousands of working people behind. 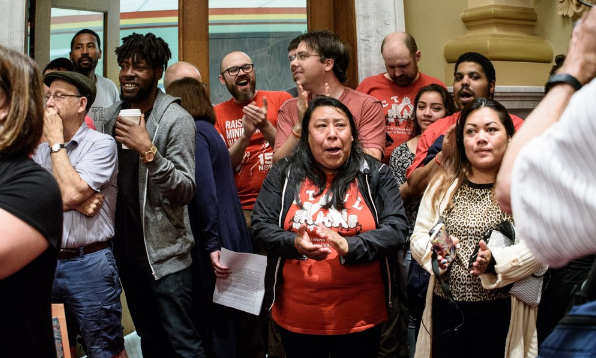 Still, it is important to recognize the massive and historic significance for the broader movement in the fact that 25 cities in Oregon are now on a clearly defined path to a $15 minimum wage. We sincerely hope that victory serves to inspire others across the nation to continue to Fight for $15. 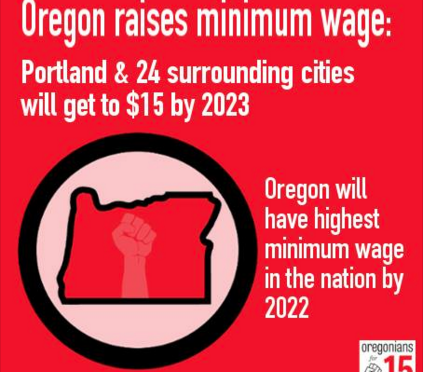 We recognize the significance in the fact that Oregon will now move to the highest minimum wage in the nation. We also recognize the material importance of the fact that half a million low-wage workers and their families here in Oregon will now be getting raises of up to a dollar per hour every year for the next six years, raises that they had no guarantee of prior to the passage of this bill. It is important to recognize and take stock of these things, recognize them for the victories that they are in and of themselves, and thank 15 Now Oregon, 15 Now PDX, Jobs with Justice, PCUN, OSEA, OFNHP, Laborers Local 483 and all the other organizations, low-wage workers, labor activists, and small business owners across the state who have poured their time and their effort, their hearts and souls into this struggle for the past two years. To all of you, we say thank you and we appreciate you. At the same time, we also have to recognize that the new minimum wage plan for Oregon is a far cry from the statewide $15 minimum that Oregonians have been demanding for those past two years. Aside from leaving most of Oregon behind at a lower minimum wage without restoring local control over minimum wage laws, perhaps the most glaring deficiency in the recently passed bill is that despite moving Oregon toward the highest minimum wage in the nation, it does not even begin to create a living wage anywhere in our state. It doesn’t create minimum wages that allow low-wage workers and their families to be self-sufficient. According to the Self-Sufficiency Standard for Oregon, a single parent needs anywhere from $15-23 per hour in one half of Oregon’s 36 counties in order afford the basics for her family. That study was conducted in 2014, not in 2023. Yes this bill does increase the minimum wage, but it is too low and too slow. As this bill is clearly inadequate in providing a living wage for working Oregonians, we will continue collecting signatures for IP 41, the statewide $15 ballot initiative that phases in over three years, by 2019. At the same time, in light of the legislative bill’s passage there are a number of factors that need to be considered in honestly determining our continued viability for the 2016 election. Over the next month we will be having conversations with the members of our coalition and other stakeholders to examine the shifting political landscape around the minimum wage issue in Oregon. This landscape is still rapidly shifting. For example, it has already been announced that a new “bipartisan” minimum wage bill is being introduced to try and roll back the bill that just passed along party lines. Through these discussions it is our hope to discern the most strategic path forward for the continued struggle and agitation around a living wage and other issues of importance to Oregon’s working class. 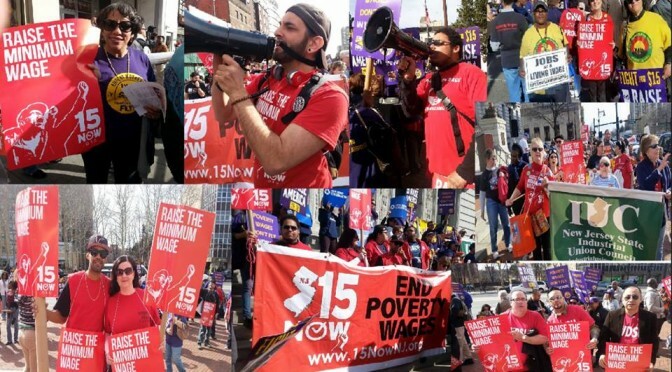 Three years after New York fast food workers first went on strike demanding $15 an hour, cities and states across the country have significantly increased their minimum wages. These victories were given tremendous momentum by the historic impact of the $15 an hour struggle in Seattle in the Spring of 2014. Like many other improvements in the lives of working people throughout the history of this country, these minimum wages had to be fought for, and anti-capitalists led the way. 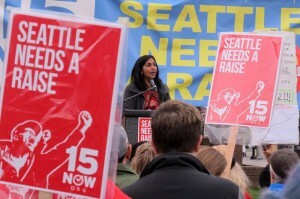 Nobody in Seattle’s halls of power were talking about a $15 an hour minimum wage until Socialist Alternative’s Kshama Sawant was elected in November of 2013. A few months later, they’d established the highest minimum wage in the country after multiple protests, neighborhood meetings, pickets and even strikes. 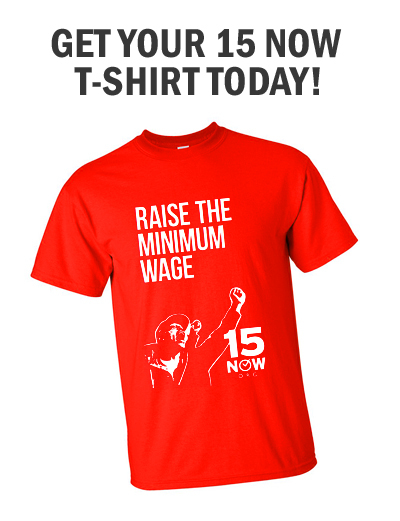 In January, thousands of Seattle workers will get another raise on the path to $15 an hour. After the Seattle victory, the labor movement across the country was encouraged to win the battle for wage increases. Also, many local politicians proposed enhanced minimum wage proposals in order to both build their electoral bases and sometimes to try to “cut off” the movement from growing and demanding more. New York, Chicago, Los Angeles, Washington DC and countless other cities have seen big improvements for low-wage workers. In 2016, the battles will go statewide in California and Oregon. Despite these victories, we should make no mistake about the overall situation–corporate America is still trying to make us pay for the crisis that their system created. They’re entrenching the “two tier” system of low wages for new hires in the auto industry. Big business is also still on the attack against public education, forcing the Seattle teachers to fight back and go on strike. Workers are showing a growing willingness to struggle, also reflected politically in electric support for Bernie Sanders’s message of “a political revolution against the billionaire class”. Throughout the history of social justice struggles and the labor movement in this country, initial struggles led by anti-capitalists have given life to broader struggles of the working class. The mass “sit-down strikes” of the mid-1930s–which transformed labor relations in this country–were preceded by three strikes in 1934 led by anti-capitalists. The labor uprising of the 1970s was foreshadowed by the radicalism in the anti-Vietnam War movement, the civil rights movement and the black power struggle. The biggest strike wave in the history of this country (per capita), in the 1940s, came at a time of looming attacks on union rights, most notably the anti-labor Taft-Hartley Act against the right to strike. Even when the bosses are on the offensive, we can fight back and win. The 15 struggle can pave the way for bigger movements of workers, youth and oppressed people. The coming wage increase in Seattle is a reminder of the struggle it took to win: electing working-class candidates and building grassroots mass movements with the support of union activists. In the week of November 10th and 12th, low-wage workers, unions and students across the country will once again raise 15 as part of a national day of action and a Million Student March, alongside demands for union rights, paid sick time and free public education. The movement to increase minimum wages should link up with other struggles of working people–from battles to defend and extend public education to the Black Lives Matter movement. We should build on our strength and mobilize to win 15 in more cities and statewide in California and Oregon in 2016. These struggles, built through the grassroots methods advocated by 15 Now, can help working people gain the confidence they need to challenge other injustices of the system.